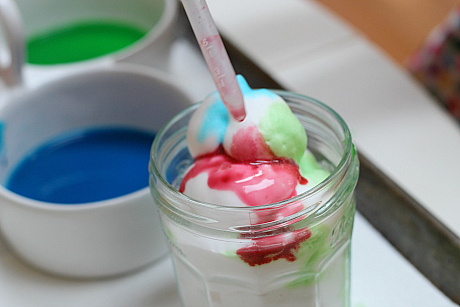 What would happen if we put watercolors in shaving cream? What about vinegar ? Or oil? 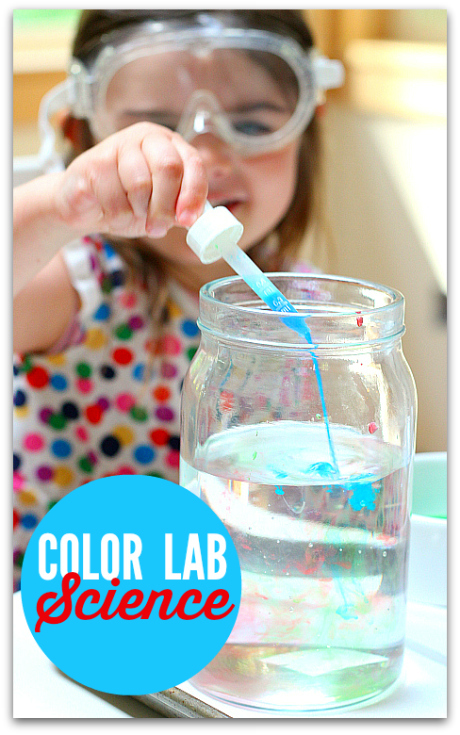 Great hands on science always begins with ” I wonder…” and this color lab science activity was no exception. 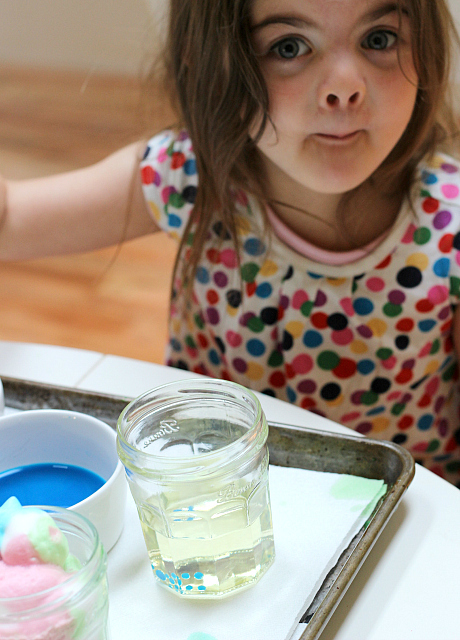 We wondered what would happen if we mixed water colors and different household liquids. After we explored our set questions it was time for completely kid directed play. 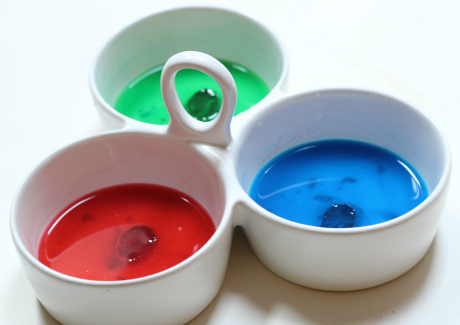 We used liquid watercolors made with plain old paint instead of food color to avoid staining. Food color will make much more vivid colors. Gather your materials. We used water, vinegar, shaving cream and oil for our liquids, liquid watercolors, some jars, an eye dropper, a cookie sheet, and goggles! 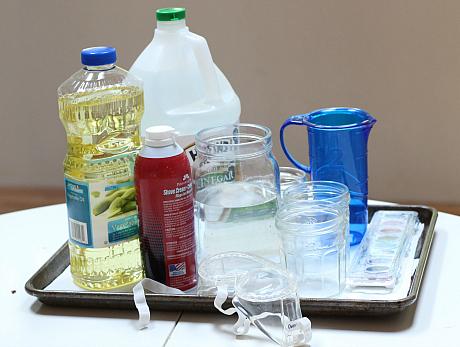 Start by making liquid watercolors. Pop the disks out of the watercolor tray and add a little water. Sit for a few minutes and stir. Now you are ready to set up your color lab! 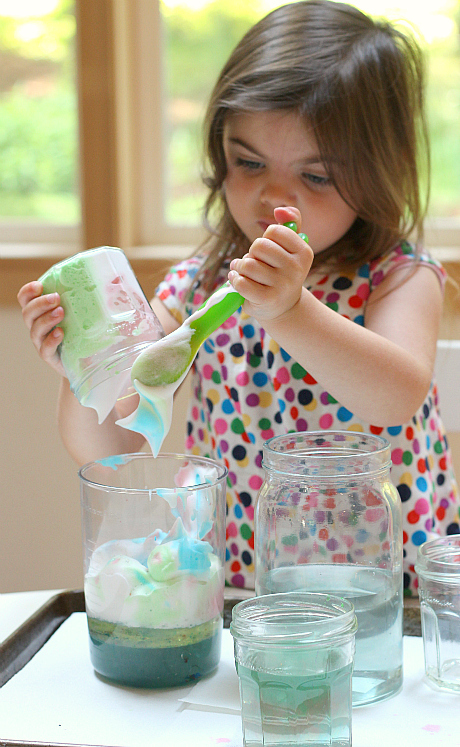 Pour the liquids in ( I did the shaving cream) . Time make a few predictions. Grab your eye dropper and start adding colors. 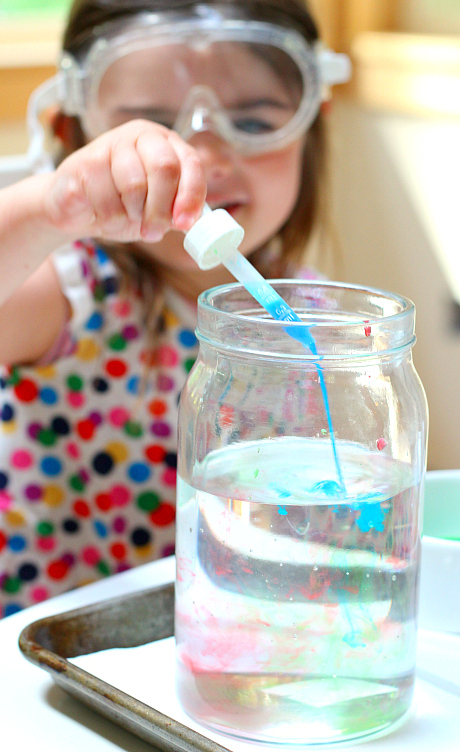 The eye dropper is important because it gives this activity an element of fine motor development as well, it takes a lot of coordination to make eye droppers work and works out the pincer grasp too. She noted how slowly the colors floated down through the water. The colors seems the same in the vinegar. I asked her if anything was different and she said the smell! 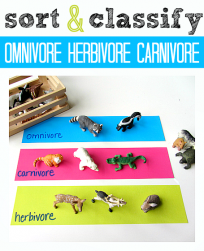 Observing is a huge part of science! 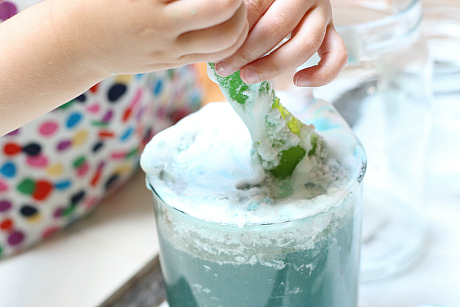 The shaving cream was interesting because the color spread over it but didn’t mix much. She also discovered that if she pinched the eye dropper really hard the watercolor made a hole in the shaving cream. The oil was rad. She had no previous experience with water in oil. She was amazed when they turned into little dots of color and slowly sank down to the bottom. I loved seeing her experience this for the first time. Time to play. After going through each liquid it was time to mix them all together. The shaving cream didn’t pour as well as the water did. 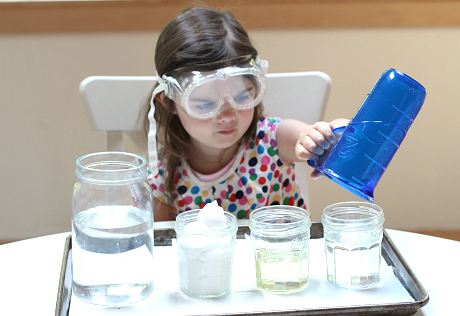 Want more science ideas for little ones? 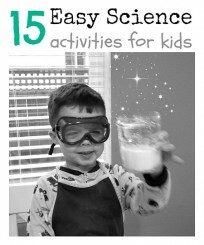 Check out our Science for Kids Pinterest board. I may be too late but you could use a 1/4 teaspoon measuring spoon for similar results, except making tunnels in the shaving cream. I should really know this but I don’t! 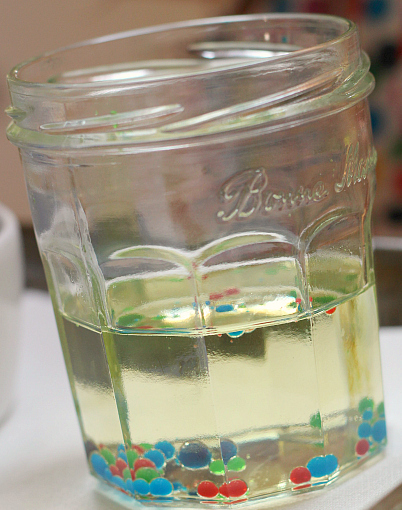 What’s the explanation why the water beads sink in the oil? Did this with my 7 year old today. She loved it! Her favorite was definitely the oil. She figured out how to make bigger and smaller color drops by adjusting how quickly/ slowly she squeezed the dropper on the surface of the oil. 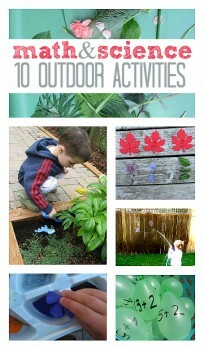 That is so rad- I think I need to get my 7 year old in on the action this summer too!